The Squash is playful, humorous, inquiring, and subtly irreverent. 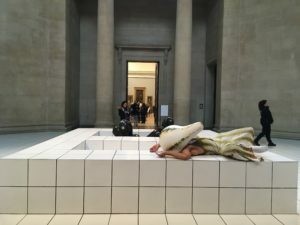 Anthea Hamilton’s latest project is a witty response to what Tate Britain represents: the maxim referent of establishment art. Raquel Villar-Pérez on the Tate project of Anthea Hamilton. 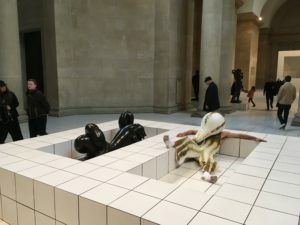 Anthea Hamilton’s latest project for the annual Duveen commission at Tate Britain, The Squash, was unveiled on the 21st of March. It is, undoubtedly, one of the most suggestive art projects I have seen lately; a project opened to as many interpretations as spectators will visit the museum in the next six months. The mise-en-scene is very modest: over 7,000 white square-shaped tiles cover the historic floor of the neoclassical gallery. 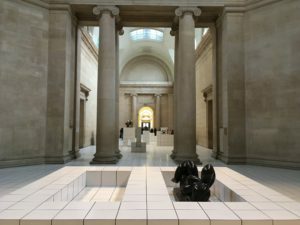 Numerous Tetris-like pieces made of the same tiles rise from the floor, generating various platforms that emulate sofas, chairs, a double bathtub, and even a sort of vertically inverted pool at the very end of the gallery. The neutral whiteness along with the neatness of the aseptic space may remind of a hospital, of a centre for psychiatric internment, of a sauna, or simply of a high-end swimming pool. 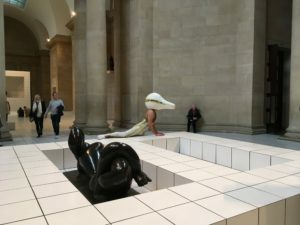 Embedded within the artificially created environment are nine sculptures part of the Tate’s collection and one of The Hepworth Wakefield permanent Art Collection. These are works by Henry Moore, Bernard Meadows, Frederic Leighton FE McWilliam, Henri Laurens, Jean Ipoustéguy, Arnold Machin, and François Stahly. In the midst of such splendor, a dancer in a plump and succulent vegetable-like suit rambles throughout the space in constant dialogue and interaction with it. 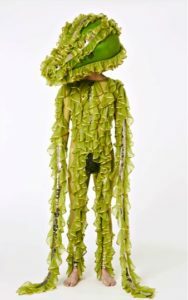 Aiming to encourage reflection upon how the space is experienced other than through sight, Hamilton has conceived her performers as animated vegetables. For this project, the artist retrieved a black and white photograph that she found twelve years ago whilst she was a student of the Royal College of art. Apparently, the photograph features a person in a striped body suit and a giant marrow for a head. Unfortunately, the caption of the photograph was left out when photocopying the image and there is no reference to who, why, when, and what, hence, allowing Hamilton to freely appropriate, interpret and re-create it as per her will. 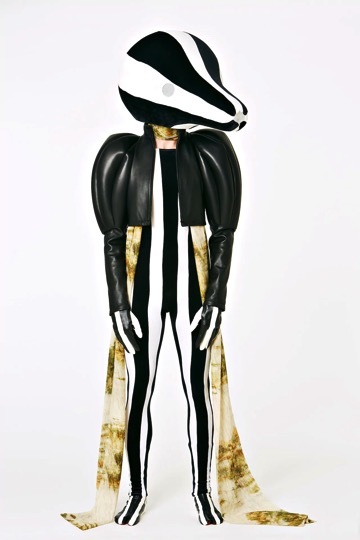 Highly texturized, the costumes evoke the Italian commedia dell’arte. She has collaborated with the creative director of LOEWE, Jonathan William Anderson, to design the seven different outfits that a roaster of 14 performers will use during the six months that the exhibition will be on show. I have spoken to some of them about how does it feel being part of such a project. Raquel Villar-Pérez: What do you think of when performing a live vegetable? Jia-Yu Corti: Universes where imaginations are transmitted through my actions and inactions. Jasmine Chiu: The world becomes timeless and there is a peculiar silence and stillness that inhabits your insides. There is a feeling of mastery and ownership over being exactly where you are, and how you are. The objective, too, is not to perform or demonstrate what it is to be a vegetable, but to allow an audience to be with you while you explore the possibilities of a vegetable — what is it for a human to become a vegetable? And what is it for a vegetable to be human? The gourd-like head pieces also physically give you a different sense of weight, balance, and light. So throughout the experience I am also trying to navigate how it is to have the heavy, massive weight of a squash. Carlos María Romero: Rather than thinking I experience all sorts’ things while I am performing. I am completely engaged with what is happening as all my body is engaged. The mask and the costume definitely changed completely the way you move and what you see and hear. The world becomes all about sounds and touch. 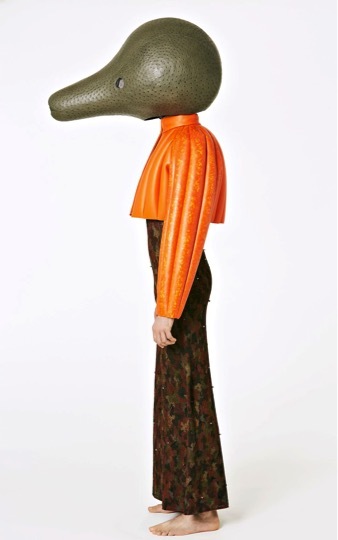 We can’t see our bodies as the holes of the mask are on the sides and one at the end/or the Squash nose. We listen a lot to our own noises and for me it’s like been in a submarine, like been inside something else and that experience becomes me too. So, in a way the space reduces and the eyes are not anymore the dominating force of everything. It’s great to discover things that you are not immediately seeing. And also encounter the audience and how they react. They are overwhelmed by the beauty and weirdness of the costumes. And they feel very invited to inhabit the space as it’s in a way very domestic because the tiles. The performers know that this is our home that we dwell it, but it’s great to experience how the public do that too. And then, I never think of the Squash as a vegetable, I understand it more as all forms or ways of inhabiting the world that are not what we know or we consider “like us”, or in a more political sense that don’t fit into the idea of “the human”, that it’s for me a very colonial concept. Everything that is strange, weird, or that is the other. RVP: As an artist, what do you want to convey to the audience that astonishingly stares at you at the Dunvee Gallery? JYC: The gallery is transformed into a home where the squash inhabits, and in that sense, I am at home where I receive, invite, entertain, communicate, rest and hide from the audiences. JC: I want them to feel invited in my Squash home and realize that by stepping in; they too, become part of my Squash world. They become part of the composition; and my being reflects very much on what the audience is, and brings. It’s not just about watching me but about being a part of, and contributing to the experience of The Squash. CMR: I don’t want to convey anything as such, I just want them to engage with the extraordinary force of artistry and how that opens the world we live in. I want them to appreciate the strangeness and the legacy and contribution of artists, so that there is an appreciation of other ways of being in the world, and that they are so close to us and that we should not be afraid of them but simply engage with curiosity and respect. Hamilton plays with set of binaries: living sculptures versus static disciplined statues; the colorful costumes versus the dominating dark colors of the still figures, and against the nuclear white backdrop; the heaviness of the material with which the observing figures are made versus the weightless and grace of the performing vegetal; and the staticity of a vegetal versus the mobility of this particular one. Raquel Villar-Pérez is an art curator and art writer based in London. She is interested in decolonial discourses and aesthetics within art practices from the Global South, mainly from Africa and Latin America, and how they resist the trends set by Globalization. She is very sensitive to women experiences and notions of transnational feminisms, and how contemporary art practices echo them. She tends to work collaboratively to open up participative processes to generate novel inclusive and progressive art narratives.